I’ve really gotten into running in the last four or so years, and have always dreamed of having a canine partner. Unfortunately, none of the dogs I’ve ever owned, sitted, or fostered have ever really been runners! Barley was too old by the time I picked it up, Zabora literally could not run in a straight line, and Baxter had his own agenda when it came to our exercise speeds. I would get us all geared up only to decide a quarter mile into our route that the effort I was putting into convincing each dog they wanted to run with me was far more than the actual run itself, and we would both give up and walk home. It was fine – each time it ended up giving me a good laugh and some quality time with my pooch. This past weekend I ran the DC Rock ‘N Roll Half Marathon. I love running these races in big cities because so many spectators bring their dogs out to watch. 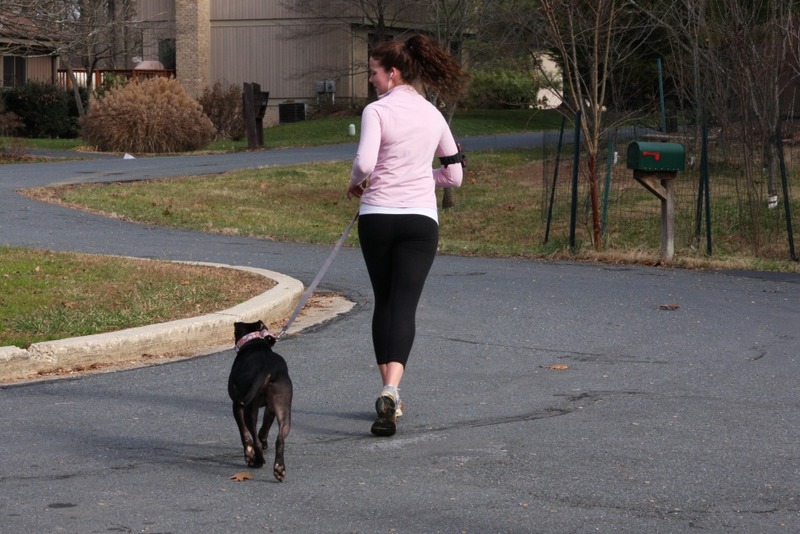 You’d be surprised how counting the pitties along the route can easily make the 13.1 miles go by quick! Or guessing the breed break down of the mutts I passed, or ooh-ing and aww-ing at the puppies. It adds another great element to the run for us dog lovers. The best part came from a woman I was running behind for some of the route. She gave her dogs to her friends who came to watch the race. At every checkpoint, there were her dogs so excited to see her! She would run up, let them jump all over her in full blown “I can’t believe it’s really you, you’ve been gone for so long!” mode, then keep going on her way. Can you think of better motivation than being greeted by your favorite slobbery kissing, paw bouncing, tail wagging pups when you’re exhausted and trying to push through those last miles? It helps seeing my family, but I can only imagine how happy it would make me to see the smiling faces of my dogs along the route. I’m really hoping one of my next fosters will be a runner. Of course I will love them either way, but I can’t wait to share my long evening runs with a jogging partner – someone I won’t have to worry about going too fast or too slow with! 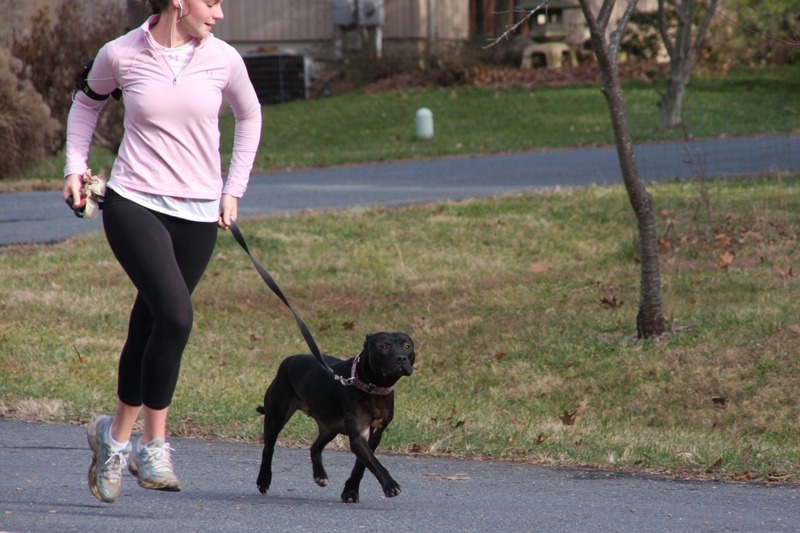 This entry was posted in Dog talk, Rescue/Humane Society, Uncategorized and tagged exercise, fostering, half marathon, running, running with dogs. Bookmark the permalink. Congrats on the half marathon! I definitely want to do the DC Rock & Roll Half next year. My sister lives there and runs. I think it would be so much fun. The last one I ran had little to no spectators and no dogs. :( I can see how they would be an awesome motivating force though! That’s awesome! Yeah come to think of it, I don’t think I would know how to prepare myself for a run with a dog haha thanks for the advice! The only races I’ve done have been the DC & Baltmore halfs. They’re popular enough that theres always a ton of spectators – I don’t know HOW you could possibly survive with nothing distracting you along the route… sounds like a loooong 13 miles! This is the first year DC was rock ‘n roll so I expect it to only get better – you should definitely sign up for next year! That’s fantastic! I’ve thought a lot about getting back into running again. Maybe if I include my dog this time I will have a lot more fun. She is probably more up to it than I am! You can borrow my Badger for a run. I’ve thought about taking him running, but I’m more of a low-impact activities person, so we mostly just walk and occasionally hike. Maybe you can borrow a foster dog for one of Ur races. Too cool. Congrats on doing the half-marathon! I am currently doing Couch to 5K training and I tried to bring Turk with me on a walk and he dragged me for about two blocks before I gave up and just started walking. Lucy is a puller too, so I haven’t tried it with her yet, but maybe I should?